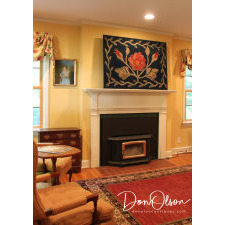 Black Eagles Quilt; The bold contrast of the unusual black eagle forms meticulously sewn and juxtaposed against the vibrant yellow background make this quilt stand out when compared to other quil..
A Room Size Pictorial Hooked Rug; This cheerful and lively room size hooked rug reflects the peaceful simplicity of rural life, with a blooming garden, blue-curtained red house, doves nesting, barn and Ford pa..
Pear Pin Cushion; Velvet Pear Pin Cushion. A Large Sailor's Woolwork of a Ship. 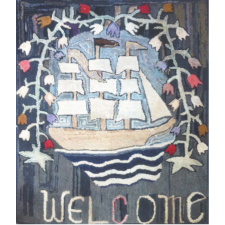 ; The large charming naive woolie depicts a large port-side view of a ship under way with both steam and sail power with smoke issuing from a tall narrow red funnel as it sails ..
Room Size Hooked Rug; A large and lively hooked rug in a difficult-to-find size, the coloration of this carpet makes it very versatile for many different settings. In excellent condition. Embroidered Bedcover; A rare embroidered bedcover featuring a unique design of an American eagle perched atop a basket of flowers, initialled by the maker. 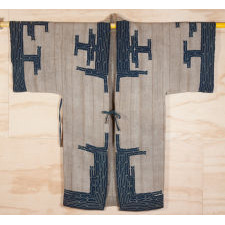 Done in shades of blue, light gold, and d.. 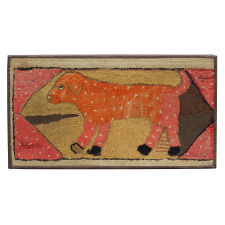 Early 20th century folky "Cat, Bat, and Moon" hooked rug; Long hooked rug with wonderful jumping cat in front of a very folky bat with the moon on both ends. Professionally mounted, minor repairs to lower left. 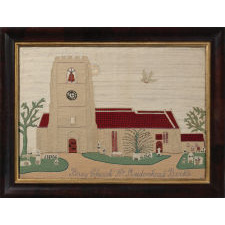 Woolwork Picture of Bray Church, Near Maidenhead, Berkshire, England, circa 1850; A large and very handsome needlework picture, this is entitled “Bray Church Nr. Maidenhead Berks” and the subject is the wonderful, famed medieval church built in ..
American Crewelwork; American Crewelwork: Over 100 How-To Stitching Diagrams, 140 Famous Traditional Designs and Contemporary Adaptations, Photographs of Early American Originals an Illustrated Hi..
Samplers: How to Compare & Value; Samplers: How to Compare & Value a Miller's book, by Stephen & Carol Huber. Hardcover with dust jacket. 176pp. more than 75 excellent photographs showing how to analyz..
Grand Army of the Republic Quilt; CottonCirca 188062.5" x 75" This quilt is decorated with appliques of the badges of the corps of the Grand Army of the Republic, a fraternal organization composed of ve..
Needlework Picture by Susanna Hoch, dated 1848 Berks County, Pennsylvania; Wool on canvasOriginal walnut frameH: 29"; W: 31" A colorful Biedermeier style pictorial sampler wrought by Susanna Hoch (1840-1909) from Oley Township in Berks County,..
Grenfell Mission "6 Mallard Ducks"; Six mallards in breeding plumage taking flight. 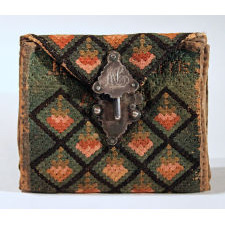 This mat was hand-hooked from silk stockings by ladies at Grenfell Labrador Industries (label attached), St. Ant..
Embroidered Pin Cushion; Lovely embroidered silk on silk pin cushion, American or English, circa 1800, with different floral motif on each side. (Minor loss.) Dia. 2"; Ht. 1 3/4"
Poor Man's Quilt; Blues and brown gingham. Many squares pieced, excellent contion. Note the piecing of squares to "makedo" the desired size and design. Mid 19'th c, American. 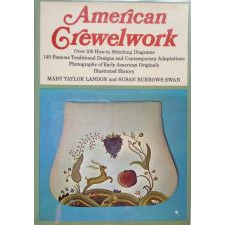 Girlhood Embroidery: American Samplers & Pictorial Needlework 1650-1850; Girlhood Embroidery: American Samplers & Pictorial Needlework 1650-1850 by Betty Ring. 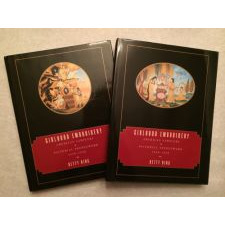 Two volume hardcover with dust jackets, in As New condition. No slipcase. 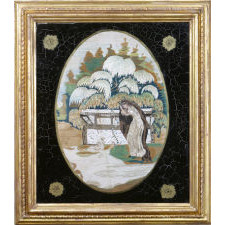 More than ..
Needlework "Sampler"; A rare and striking needlework "sampler" with pastoral vignettes alternating with embroidery patterns. 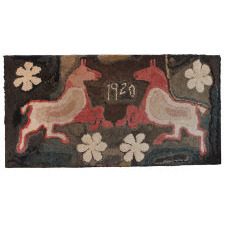 Navajo sandpainting rug; The textile offered here is a very rare early sandpainting rug. It represents the 8th day of the Nightway Ceremony. 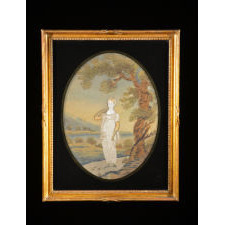 The Navajo believe that people should be in bal..
Regency Silkwork; A Regency silkwork/ watercolor of a young lady in a nice dress and shawl standing under a wonderful twisting tree. The lady's face is a painted piece of ivory which is rare to.. Flower Pot Block on Point Quilt; Flower Pot on Point Quilt from Iona, Lebanon County Pa. late 19th century. 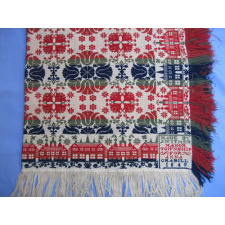 The bold pattern and bright colors make this piece a fine example of southeastern Pennsylvania Germa..
Coverlet with Point Work Weave; Coverlet, point work weave containing red and green wool and white cotton. 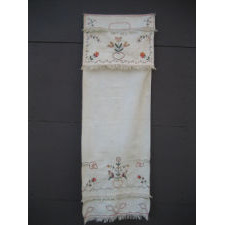 Coverlets of this type containing green wool are less common than the usual red, white and blue exam..
Chain-Stitched Hand Towel; This rare chain stitch decorated hand towel is from southeastern Pennsylvania and was made during the mid 19th century. The chain stitched decoration is rarely seen on hand to..
Pleasing Diminutive Hooked Rug; American, most likely Northeastern, dated 1920. Cotton and wool fibers. 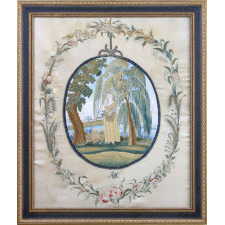 Composed and made in manner that would seem earlier, this hooked rug has a coveted combination of soft ..
American Needlework Treasures; Betty Ring. 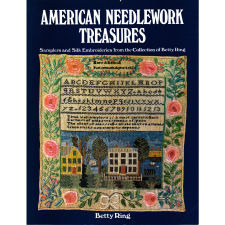 AMERICAN NEEDLEWORK TREASURES: SAMPLERS AND SILK EMBROIDERIES FROM THE COLLECTION OF BETTY RING. New York: E. P Dutton in Association with the Museum of American F..
Child's Emboidered Apron; A child's apron emboidered in wool on cotton with flowering vine decoration and a blue scalloped edge. Made circa 1830. Found in Maine. 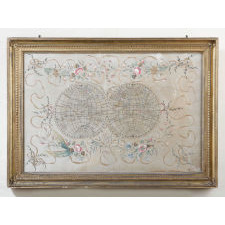 Now mounted on a dark..
Embroidered Bed Cover; E M SA fine and rare example of an embroidered indigo and ivory colored wool bed cover from the early nineteenth century, with floral and flower/sunburst designs. ..
Ninth Plate Ambrotype; Ninth plate ambrotype of a woman with her sewing tools on a table beside her. New England circa 1850. Fine condition and in nicely decorated case paper board case with b..
Victorian Crazy Quilt ; A silk Victorian Crazy Quilt in excellent condition. 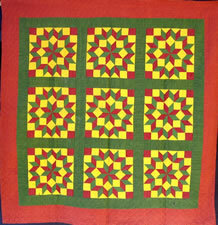 The quilt is professionally stretched and mounted for hanging. 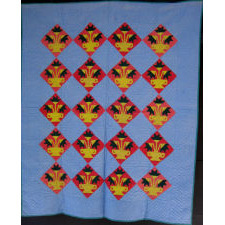 Navajo Germantown Childs Blanket; Navajo Germantown Childs Blanket. Bright colors, tight weave and somewhat intact end fringe. Great condition. 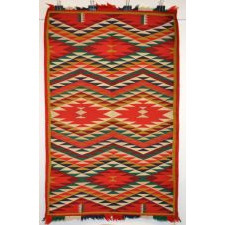 Navajo Germantown eyedazzler blanket; After the railroads arrived in the Southwest in 1880, a thriving trade developed between the Navajo and eager Anglos throughout the rest of the United States. The Navajo gener..
English Needlework Picture; Charming early 19thC needlework picture of biblical scene depicting Ruth and Boaz. Ruth holds a bundle for wheat in her apron while the wealthy Boaz woos her. Workers are thre..
Large Hooked Carpet; A very fine and unusually elegant hooked carpet in subtle colors and excellent condition. Wool and cotton on burlap foundation. 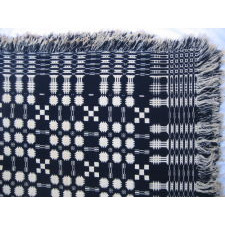 Coverlet Doubleweave; This bold dark blue and white design is woven with white cotton and blue wool in a double weave technique. 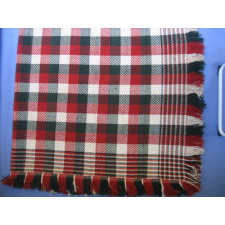 The coverlet has applied fringes on the sides and a self-fringed bot..
Navajo Two Gray Hills rug; This textile is an example of an early Two Gray Hills rug. A central diamond with classic Navajo stepped edges is linked to geometric designs with a cross center and "ho..
Navajo Transitional blanket; This blanket is woven out of handspun wool, some it dyed with synthetic dyes. The wool is quite soft and is likely from sheep that have Churro sheep heritage. 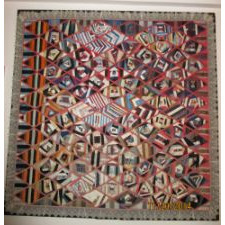 The design has 5..
Schoolhouse Quilt with Crisp Red Houses; The wide spacing between the components of each of the 25 red houses against the white ground create an overall abstract quality to this quilt with such exceptional floral and.. 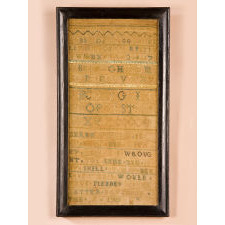 Outstanding large folk art theorem; A very folky and abstract large size theorem on velvet in the original frame ,glass and backboard. 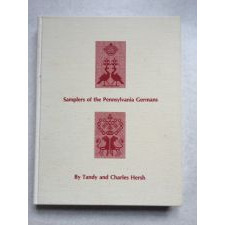 Oversized bowl with turned handle done in yellow and red resting on a marble..
Samplers of the Pennsylvania Germans; Samplers of the Pennsylvania Germans by Tandy and Charles Hersh was published for The Pennsylvania German Society, Birdsboro, Pennsylvania, in 1991. 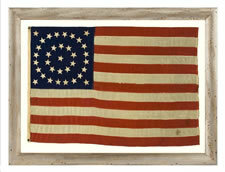 The book takes an in depth..
Patriotic Bedcover Embroidered with American Eagle and Shield ; Wool on wool. Very minor repairs to foundation. 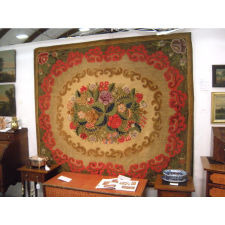 Waldoboro Style Scroll and Floral Hooked Rug; SPECTACULAR GRAPHIC RUG FROM MAINE. C1860-80 WITH RICH EARTH TONES WITH ACCENTS OF RED. CENTRAL FLORAL MOTIF IS RAISED AND SCULPTURED. 7�X 6�1�. 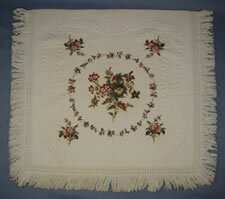 SEE TURBAYNE J., HOO..
Three 18th & 19th c. Needlework Pieces ; Needleworked fan, pocket and Bible cover. This rare and wonderful grouping of textiles worked by Esther Moore before and after her marriage has survived intact with a later ne..
A rare pair of Dutchess County, New York Samplers; Two rare samplers worked by the Vielie sisters ten years apart in 1830 and 40. One depicts a colorful vase of flowers and the other, the family homestead which still..
Nine Block Star Quilt; The bold red, green, and yellow printed cottons in this bedcover identify it as a product of Pennsylvania German quilters located in southeastern Pennsylvania. Finely executed..
35 STARS, 1863-65, CIVIL WAR PERIOD, A VERY RARE, SMALL SCALE EXAMPLE WITH A BEAUTIFUL MEDALLION CONFIGURATION, PROBABLY MADE IN BALTIMORE BY JABEZ W. LOANE, FOUND AMONG THE POSSESSIONS OF PHYSICIAN, CHARLES F. MCEWEN; 35 STARS, 1863-65, CIVIL WAR PERIOD, A VERY RARE, SMALL SCALE EXAMPLE WITH A BEAUTIFUL MEDALLION CONFIGURATION, PROBABLY MADE IN BALTIMORE BY JABEZ W. LOANE, FOUND AMONG THE P..
Appliqued Crib Quilt ; This rare and elegant early cotton chintz appliqued crib quilt is signed on back in ink "Made for Mary Steele McCulloch by her Grandma Foulke in her 73rd year. May 6 1854." Fi..